The file manager is a central location for files you have uploaded. You can browse, upload, and manage files here. 1. Click on Files in the toolbar. 2. When adding or editing a page, click on the link button in the toolbar. Then click Browse Server in the links overlay. The screenshot below shows the manager and explains each section. Folder's Pane – The section on the left is known as the folder's pane. This contains the tree view of the folders that you can navigate. You use folders to organize and categorize your images. Create, rename, and delete folders here. Toolbar - The toolbar is the menu that holds the icons. By default it holds the Upload, Subfolder and Filter Settings icon. On clicking a file in the manager, the toolbar shows other icons that could be used for various functions. Upload - The upload button is used to upload files and into the manager. New Subfolder - Used to add a subfolder. Filter settings: The icon on the top right allows you to apply filters to the files being showed in the manager window. The upload button is used to upload files and images into the manager. Clicking on Upload opens a dialog box where you can select the files and images that you want to add. Once you've selected your files, press Open. The following error messages may appear when uploading files. A file with the same name is already available. 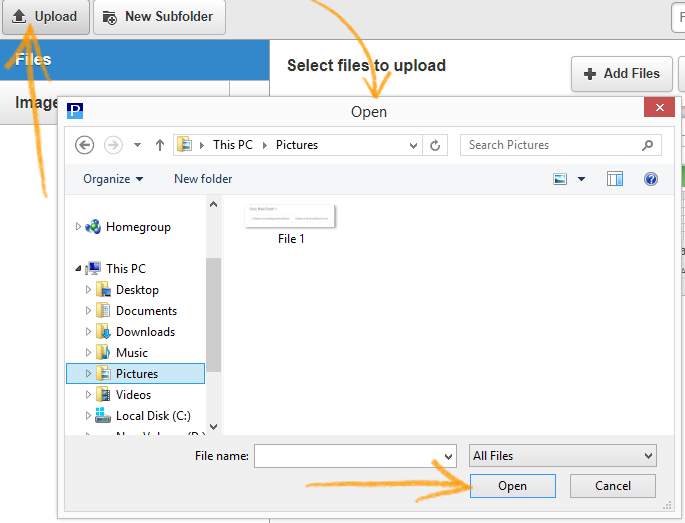 The uploaded file was renamed to "filename(1).ext"
This message indicates that the uploaded file name is already in use by another file in the same folder. To avoid a conflict, a consecutive number, the "(1)", gets appended to the original name. The file that you attempted to upload was not accepted. The most common cause for this message is that the file extension is not allowed for security reasons. The file size might also be too large (the maximum file size accepted is 15mb). Upload cancelled for security reasons. The file contains HTML-like data. The uploaded file contains HTML code. For security reasons, only files with selected extensions are allowed to contain HTML code. 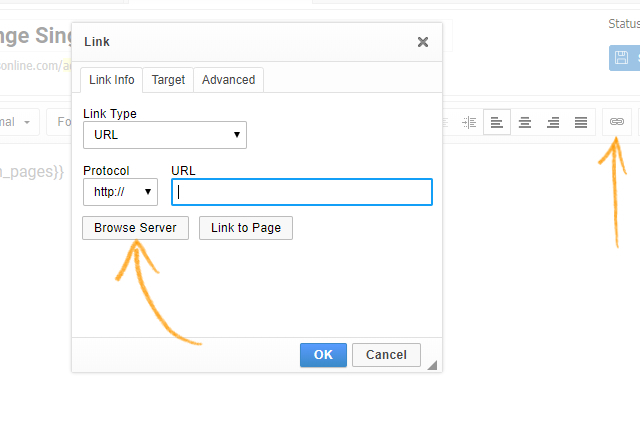 To insert a file such as a PDF or a document into a page, insert a hyperlink that will download the file. After you have uploaded the desired file as described above, edit the page. From the editors toolbar, select the hyperlink option. From the links overlay, select Browse Server, and select the file you want to insert from the file manager. 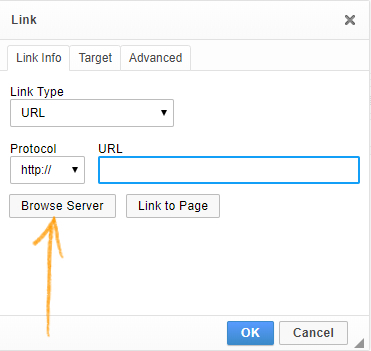 A hyperlink will be inserted in the page. If the image has already been uploaded to your image library, you can browse the server and select the image from your file manager. See this guide for inserting images. Deleting an image from the file manager will automatically remove the image from the page. To rename an image or a file, right click on an image or file and select Rename. Renaming an image or a file will rename the image or file paths in all pages across the site. To move an image or a file, drag the image or file to the specific folder at the left. Click on Move Here. Moving an image or a file will update the image and file references across the site. To copy an image or a file, drag the image or file to the specific folder at the left. Click on Copy Here. Copying an image or a file will not affect the existing image or file and its path.